Copyright, 1886, by Chas. D. Blake & Co. Words by Allie L Griss. Music by W. A. Kellar. I know it's getting late, love, 'Tis twelve o'clock and past. And, darling, won't you give me one more kiss And then I'll go! The stars alone can peep, love, the moonbeams only see. Oh! won't you grant me this request, and give one kiss to me? I pray don't look so pouting, and frown upon me so. But, darling, come And give me one more kite and then I'll go. But. 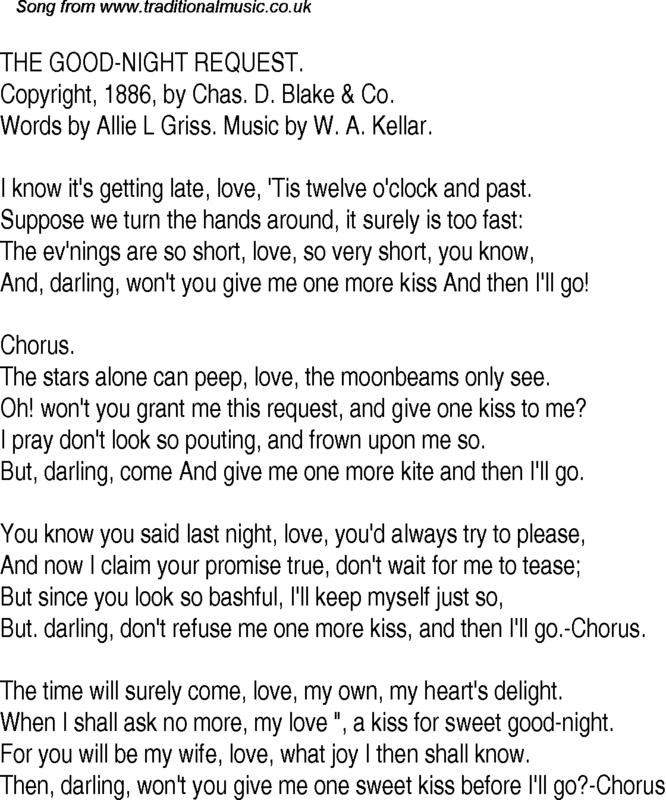 darling, don't refuse me one more kiss, and then I'll go.-Chorus. The time will surely come, love, my own, my heart's delight. When I shall ask no more, my love ", a kiss for sweet good-night. For you will be my wife, love, what joy I then shall know.